When I was a little girl, I developed a talent for blowing a bubble inside a bubble of pink elastic Bazooka Bubble Gum. If I added an additional hard square of gum to the rich material already processing up and down in my mouth, I could blow a bubble in a bubble in a bubble. Such oral calisthenics took practice and were not without the travails of the sport: large circular broken bubble gum grafts that plastered themselves to my tiny face or lopsided bubbles, blown too big, that drifted into my pigtail and stuck in a gossamer spider web of mess. The art of blowing a bubble in a bubble is about the deliberate act of creation, the careful attempt to place one gem inside or by another. It’s about symmetry. breakfast, and is to school on time. What we have here is an absurd message. The last line is a mess. And don’t well-meaning parents try to send their children to school rested, on time, and fed? Shouldn’t this request be made of parents every day, not just one special day? Let’s assume the following scenario unfolded in the hasty writing of this note: The principal directed her already harried secretary to write the note ASAP, duplicate it, and send it to all 4th grade classrooms by 2:15 pm. The office T.A. ran the note, hot off the press, down to the 4th grade teacher. In the teacher’s rush to get that note into her students’ hands, she did not proofread it herself. The kids stuffed it into their backpacks between their binders and their lunchboxes. The lavender note crinkled. I am hoping the teacher did not write this note. Because a shiny ladybug landed on this sad declarative set of sentences, a mother, tired from her day, stopped and read. Good point, she said. I must fix Victor oatmeal in the morning. Coming to Mill Creek Academy and having Mr. Richards as my teacher, gave me bliss in my stomach. Later in the hour, I visited Mr. Richards’ classroom. Eight students sat around a table. I asked if I could join the discussion. They were arguing about the use of the word ungainly. Before I left, I asked Roger if he really had bliss in his stomach. We all laughed. I glanced back; Roger was thinking about his word choice and whether or not it had conveyed his blissful feeling. If only the secretary (or teacher?) had done the same with her note. popped bubble in a bubble? 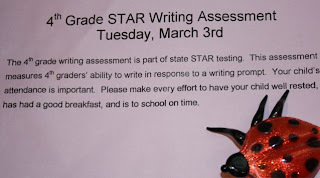 This entry was posted in Writing and Teaching and tagged public schools, sloppiness. Bookmark the permalink. Yes it is. That’s pretty sad I think. The situation you described is not atypical in a busy teacher’s day. We write many notes, rush through many communications. You are correct: sending home a note that is inaccurate or incorrect is a busted bubble. Today, I have posted about President Obama’s plan to improve education. It is only part one; but, I’d be interested how other educators feel about the topic and the perspective I have stated. I feely admit that I am an awesome proof-reader on everything… except my own writings. My red pencil flashes through documents, slashing spellings, grotesque grammar, and blemished punctuation. However, with my own writins, I tend to skip aover typos and mispellins and other inperfecttions. So I can relate to this note, regardless of who jotted it off. Although the situation is not atypical, it still is an embarrassment to the school. As a main office elementary school secretary we had a principal who, I am sorry to say, was not a good speller (even with her doctorate, and we all HAD to call her DOCTOR) and her grammar left a lot to be desired. Scary and pathetic, I think. Unfortunately, too many teachers and administrators, and yes, secretaries, are lazy about grammar. Then again, they are lazy about many things, with the excuse that they are all too busy. Hmmmm… Sorry, that isn’t a valid excuse as far as I’m concerned. I think the education community needs to take PRIDE in their written work. It will last well beyond their careers. You guys are providing causing me big smiles (with no bubble gum). Haven’t we all had the experience of calling ultra-educated people Dr. This and His Honor That…when we would really like to call them many other more applicable monikers…right? I call my husband Hizzoner Who? or is it Hizzoner Whom? Queenie….Big time laugh for me. Thanks!! Congratulations on the upcoming publication of your second book. Writing a book takes discipline and imagination. What is the title of your second book? What is it about? I want to make sure that the intention of this post is clear. We all make grammatical mistakes; they are not the biggest sins in the language arts world. Writing instructors should make grammar/usage the last aspect in the writing process. Putting those ideas down on paper and having FUN expressing those ideas is the first task. This post asks those of us directly involved with students to be as careful as we ask them to be! Roger said that having Mr Richards as his teacher “……gave me bliss in my stomach……”. “……gave me bliss in my stomach……”. It’s arresting. Colourful. An emanation from a natural writer. Wouldn’t that be something? I would love to know what many of my amazing students are doing. Some still stay in touch with me. I was privileged to instruct some wonderful people.